Ideally located right in the centre of Paris, the hotel Du Lion d'Or Louvre is in the heart of the 1st arrondissement a few steps away from the most prestigious attractions of the French capital. Among a warm and refined setting, the staff offers a personalised and efficient service throughout your business or vacation stay. This charming hotel stands out thanks to its family atmosphere and competitive pricing. 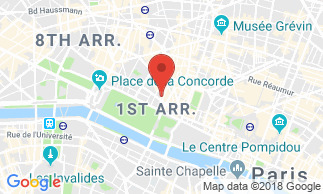 The hotel benefits from an ideal location that will allow you to travel in and out of Paris thanks to excellent nearby public transportation and taxis. Major monuments and tourist sites are easily accessible. Hotel Du Lion D Or Louvre Very good, quiet studio, no street noise, spacious studio, nice large room. Also well placed as close to the metro, the Louvre museum and quick access to important places of Paris. Hotel Du Lion D Or Louvre Location was ok, rooms too, but the double bed was in the 2nd floor that was too small for 2 people. No breakfast was bad for us and 8 or 15 euros was a bit expensive so we had breakfast out. People really kind and helpfull, specially the woman in the morning and afternoon, sorry i dont remember you name...!! SHE WAS COOL!!!! Hotel Du Lion D Or Louvre Well located Hotel, renovation work did not disturb our stay. The hotel staff is professional and always available for us. We keep the address for our next visit to Paris. Hotel Du Lion D Or Louvre Well located hotel with friendly welcome. The room for 1 person that was assigned to me was clean and comfortable. Hotel Du Lion D Or Louvre The staff is very helpful. The breakfast yummy. Location on street is not the best, if out at night go in group. Otherwise, we liked our stay. Hotel Du Lion D Or Louvre OK, I agree it was a very good location, but everything else was less than average. The welcome smile from the staff was not so welcoming. The price for a 4 night stay for 4, was really good, but you get what you pay for. The room could sleep 4 but there was no place to put the luggage, and no place to move around in the room. The room had a NICE bathroom and it was sort of clean, but the stairs and hallway need lots of work. There was no air conditioning, so we thought that opening the windows would be OK since the room faced a small street, but, the garbage truck picking up trash at 4AM and the sporadic noise of the motorcycles were unbearable. The small fan that we had to beg for could not do the job. I recommend this hotel for young people, as they can carry their luggage (no elevator) and do not care where they sleep.